A deck of 32 playing cards that was released in Spain. 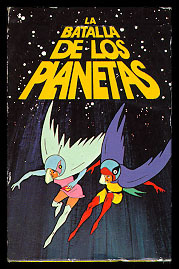 Each card had a photo taken from a Battle of the Planets episode, plus a small description of the action depicted in each image. The cards were divided into four differently-colored "suits" and could be used to play a number of children's card games (the box and select card samples are shown above).